How does a beautiful farm maiden become the most sought after princess in the kingdom? By losing her true love. Buttercup’s vivacious youth transcends during her time of mourning when she learns that the boy she was destined to marry is killed at the hands of the Dread Pirate Roberts. When she is approached by Prince Humperdink to be his ‘perfect’ bride, little does she realize how a run-in with her true love’s killer will uncover a deadly royal plot. 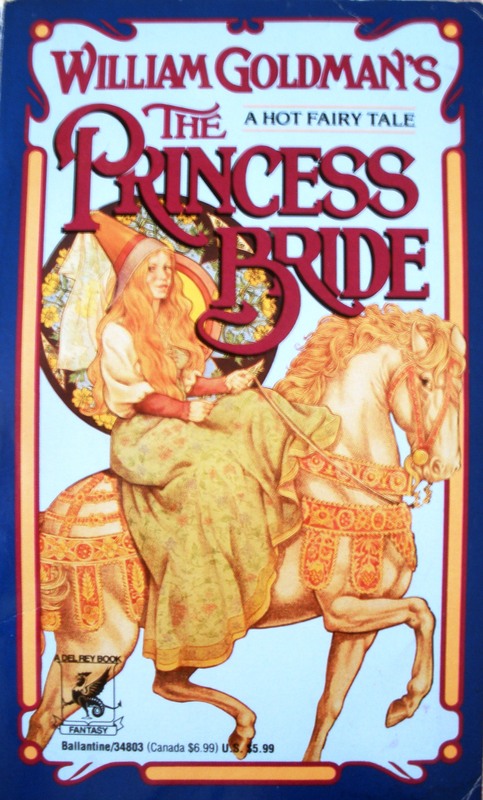 I first read The Princess Bride in high school after watching the movie. When I learned there was a book, I had to have it – and I loved it even more than the film. Since then, I have read The Princess Bride a good half-dozen times and listed it as the most influential book in my life when attending a Children’s Literature course in University. To this day I aspire to captivate readers with my own writing the way Goldman captivated me. What I enjoy most about this book is the blend of action, adventure, mystery, crime, magic, and romance making this a story of “epic” proportions. No one element outshines or overshadows another as the balance and interplay of each keep me turning the page, even after 6 reads. Goldman’s ability to blend humour while maintaining the necessary suspension of disbelief is no simple feat. As stereotypical as his characters are, he infuses them with new life and a spirit of their own in such a way that they are more than what they seem. In fact, the stereotypical nature of these characters is partially what lends them their charm. Through their use, Goldman is in fact commenting on society – our need as a nation to fall in love with wholly good and bad characters. The love-affair we have with these characters as children does not make them childish. If you weren’t already aware of it, Fairy Tales were originally written for adults but have been appropriated by children through the ages. Have you ever wondered why movies in the animated Disney chain (and other like them) do so well? Adults, and not just parents, enjoy them too. The only element that has ever bothered me with Goldman’s book is it’s structure. Not the fact that he comments on the action externally as the narrator, but the fact that as the narrator he chooses not to reveal certain elements of the story. Therefore, we get chapters only a sentence or two long that sum up what the chapter would have been about but because he felt it would be too boring to tell, he doesn’t. I wanted (and still want) to read what happens in those ‘skipped’ chapters. I know this aspect of the novel is part of the humour and Goldman’s commentary on the literary genre (among other things), but because I enjoy his narrative voice I want to read these skipped parts just to be able to laugh more. If you’ve only ever seen the movie or have neither watched nor read the book, and you happen to enjoy the Disney-like fairy tales of today, this book is a must read. Reviewed by M.J. Moores, OCT. Author. Editor. Freelance Writer.